The Paschal trikirion, (Greek: Τρικήριον/Τρικέρι, Slavonic: Троіца, Troitsa), is a three-candle holder used liturgically at Pascha in the Orthodox Church and Eastern Catholic Churches that use the Byzantine Rite. Unlike the trikirion, that is only used by a bishop, usually with a dikirion, the Paschal trikirion is used also by all priests at the Paschal Vigil, throughout Bright Week, and on the Apodosis, leave-taking, of Pascha. The Paschal trikirion is carried in the left hand by the chief celebrant, whether a bishop or a priest, at all of the services. In particular it is used while chanting the Paschal verses at the beginning of Vespers, Matins and Divine Liturgy, while censing, during the Little Entrance, or when giving the Paschal greeting. 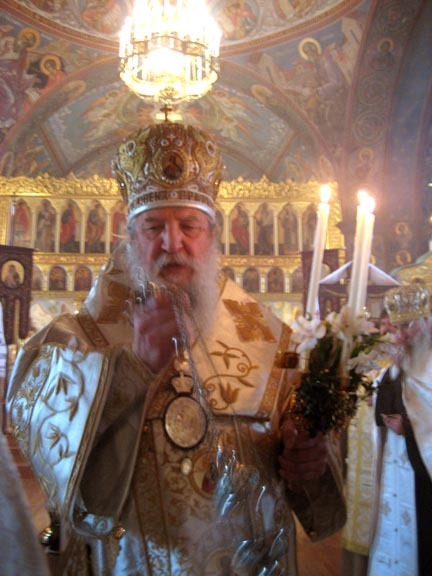 The Paschal trikirion comes in two basic forms, one following Greek tradition and the other following Slavic tradition. In the Greek form, the Paschal trikirion generally has a flat base, so that it may stand upright. Sometimes an icon of the Resurrection of Christ is mounted on the base. A vertical shaft on the top of the base terminates in three candleholders. The three candles of the trikirion, represent the Resurrection of Christ on the Third Day, as well as the three persons of the Holy Trinity, all three of whom were actively involved in the salvation of man in Orthodox theology. The candleholders are sometimes mounted at an angle so that the candles cross each other and are often tied together at the point of intersection with ribbons. In the Greek tradition, the priest may at times simply hold a large single candle. During Paschal services, the deacon carries a special candle that often is decorated with fresh flowers. 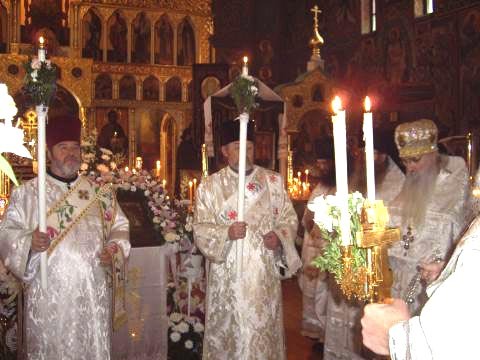 The candle is a single large candle that the deacon carries in his left hand while pronouncing litanies (ektenias), while censing, and at other times when he does not need to use his hands for other purposes. This page was last edited on February 6, 2015, at 00:13.